By the time Martinez (Oakes '04, evolutionary biology) was done, only three of the students—all of whom resided in the mostly Hispanic farming community of Watsonville, where 20 percent of the population lives below the poverty line—still had their hands in the air. "Imagine if these kids had more access," asked Martinez, whose laid-back style belies his drive to change what he sees as a worrisome divide. "What could they create? What would come out of that?" Martinez's answer was to found Digital NEST, a hip technology learning center in Watsonville designed to help young people from rural areas not only master skills like programming, game design, filmmaking, and graphic arts, but also create their own projects and get a taste of the work world by hiring out to local companies. "We need young people not just to be literate with technology but to be fluent in it," Martinez said. At UC Santa Cruz, Martinez studied to be a scientist, working in Professor Barry Sinervo's herpetology lab through CAMP (California Alliance for Minority Participation). 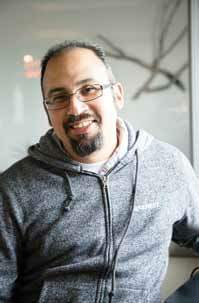 But Martinez began to feel the pull of community work and soon found himself on the ground floor of an after-school program started by ETR Associates of Scotts Valley that taught tech skills to middleschool- age girls in the Pajaro Valley School District. That project, which Martinez led, morphed into the award-winning Watsonville TEC, which now serves 15 Pajaro Valley schools. But Martinez saw the need for more. On field trips to Apple and Google he witnessed the creative, freeform culture of those companies and thought: Why couldn't low-income, minority students have access to the same thing? He brought his idea to NextSpace co-founder Jeremy Neuner, who signed on as an advisor, and went to work. Martinez collected grants from organizations like the Packard Foundation and got donations from local agriculture companies like Lakeside Organics and S. Martinelli & Co. Adobe offered free software, and a venture capitalist pledged $100,000 in matching funds. "In a world increasingly reliant on technology, this seemed like a really important program," said Philip Martinelli of S. Martinelli & Co., whose firm donated $5,000 to the project and who has seen his family-run company become more dependent on technology for juice production and quality control. It's that economic shift that fuels Martinez, a father of three, in his quest to provide the same opportunities offered to kids from more affluent communities to those who live in low-income, rural areas. Housed in a former accounting services office, Digital NEST, which stands for Nurturing Entrepreneurial Skills with Technology, is open to those from 12-24. Its brightly lit space is just as Martinez imagined: sleek desks, comfortable couches, a large-screen TV, and even free snacks to fuel long hours of creativity. On arrival, members are handed a laptop loaded with the latest software and invited to take online courses or learn from visiting faculty. Students get help writing resumes and creating their own projects, and can even gain experience by hiring out to small businesses who might need technology help. At a recent Content Marketing class, students voiced dreams of working for Google, designing a computer game, and writing or producing a Hollywood movie. "The NEST is going to be a solution for rural communities like (Watsonville): the Fresnos, the Merceds, the Hollisters, and beyond," said Martinez. "For me, this is a social justice issue," he said. "Here is a community that is economically disconnected from opportunity. And that's troublesome for me." Jacob Martinez received the Tony Hill Memorial Award as part of UC Santa Cruz's 31st annual Martin Luther King Jr. Memorial Convocation. The award honors individuals for their efforts across diverse communities in developing innovative approaches to solving social problems.